According to U.S. Commerce Department data, exports from the Albuquerque metropolitan area plummeted 43 percent, from $1.76 billion in 2015 to $1 billion in 2016, largely due to a decline in activity at Intel Corp. in Rio Rancho. Meanwhile, Dona Ana County’s export stability with Mexico largely reflects booming activity at the Santa Teresa industrial parks along the Mexican border, where some 60 companies operate. During this lecture, Mr. Pacheco will review New Mexico’s trade with Mexico and how Mexican trade is supplanting Intel’s role in the state’s exports and how Santa Teresa is poised to become the largest exporting base in New Mexico, surpassing exports from the Albuquerque metro area. Mr. Pacheco will also examine the developments in the Santa Teresa project and how the Trump administration is affecting New Mexico’s trade with Mexico. Jerry Pacheco is the Executive Director of the International Business Accelerator, the only state-wide international trade counseling program, based in Santa Teresa, NM. He also is an industrial business recruiter based in Santa Teresa, New Mexico, founder and President of the Border Industrial Association, Board Director of the Dallas Federal Reserve Bank-El Paso Branch, and a syndicated columnist on international affairs. 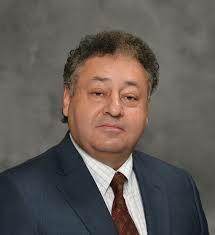 He was named by Hispanic Business Magazine as one of the “2013 Top 50 Influential Hispanics in the U.S.” Mr. Pacheco has a Bachelor of Business Administration in Marketing, an M.B.A. in International Management and a Masters in Latin American studies – all from the University of New Mexico.